Haiku by Garry Gay. Artwork by myself. When I was making this haiga, I needed a photo of a small girl. Then I remembered my wife's photo, and this drawing was made from it. 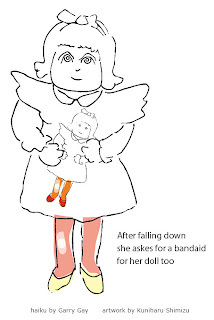 Now, my granddaughter is coming to about the same age, and to my surprise, she resembles this drawing quite a bit. It is interesting to see how DNA runs though a family. I inherited narrow and small eyes from my mother. I married a woman with big eyes. My son has nice looking eyes, and he married a woman with big eyes. Now, all my grandchildren have nice big eyes. And thus, remodling of DNA continues. 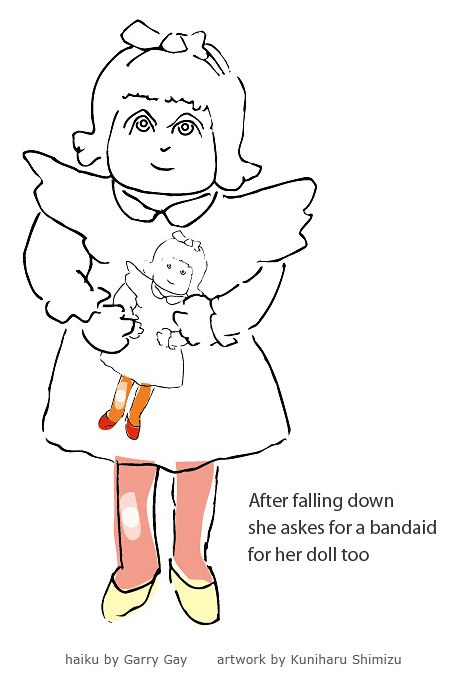 Children can be so caring, and this shows even with their dolls. This so strongly reminds me of another marvelous haiku, that I had the privilege to judge. I made a several haiga for Surridge san.